"Another old favorite of my mother's. A neighbour was making these when I was a child and I never got enough of them." Cream butter and sugar; add yolk and lemon juice and beat well. Stir in flour until well blended. Form into 1 inch balls, dip into beaten egg white then into chopped nuts. Place on greased cookie sheet, make deep indentation in center of each cookie. Bake for 5 minutes, then quickly indent centers again, continue baking for 10 minutes. 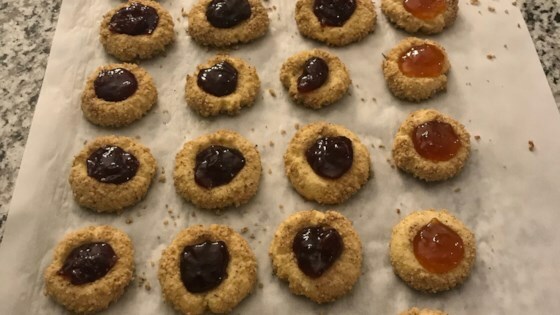 Fill center of each hot cookie with raspberry jam or jelly. Really easy to make but they fell apart after first bite didnt like that.....taste was ok could have been better......might make again and make some adjustments. I'm not a huge fan of desserts or sweets...but I could eat this entire batch in one sitting. Just like my mother used to make - TY!!! Thanks Carol for this old time favourite. Made as written with one addition of lemon rind. Turned out awesome. I also put the jam in then baked , that way it isn't sticky when you store them.. These cookies are great. Not a lot of effort to make them. I used strawberry jam and they still tasted great. i made these over the holidays. i'm not very skilled in making desserts, but if i can make these, anyone can!